Wondering How To Tie Scarves? Here Are Some Suggestions. 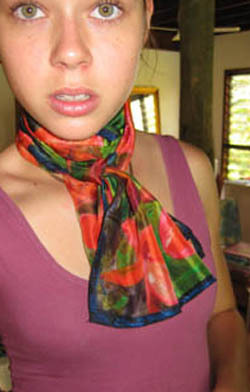 Wondering How to Tie Scarves? 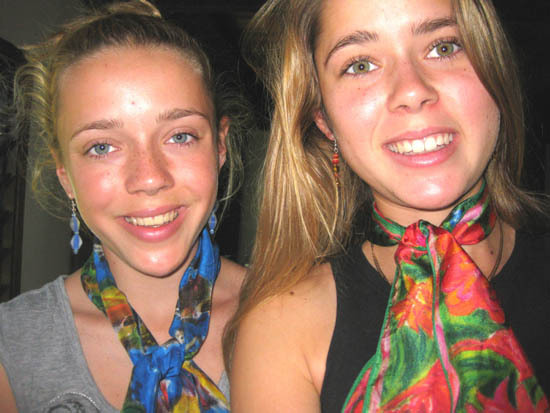 How to tie scarves, model them and photograph them for this website was a project that my grandchildren Olivia, aged thirteen and Jasmin, aged fifteen, agreed to investigate. 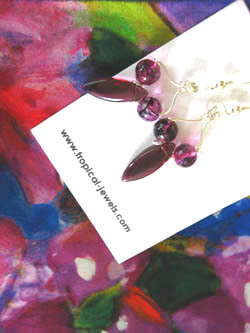 I handed over my small digital camera, a variety of silk scarves and silver and glass earrings and gave them free rein. This activity took place during a small exhibition that I was holding at Lee Walters' lovely holiday home, overlooking her sparkling pool and tennis court, set into hillside rainforest. 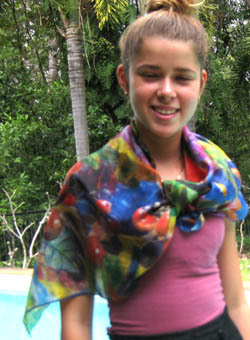 Young photographers, Olivia and Jasmin, model designer silk scarves. The pool was much appreciated by the girls, as a setting for their photos - and for frolicking in after the photo shoot! 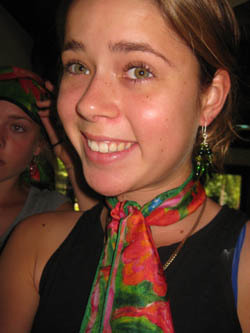 Their brief was simple - to work out how to wear scarves so that they looked and felt comfortable and also to experiment with ways to present earrings that complemented the scarves. Not really tied, but draped, this silk scarf would look great with a more formal outfit - the long end could also be flipped over the other shoulder. A gentle swing in a hammock, anyone? 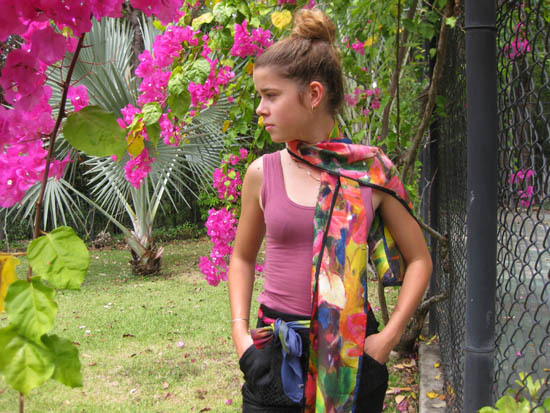 Jasmin enjoys the luxurious feel of this larger silk scarf, which features tropical flowers. She seems to be using the scarf as a flexible companion/fashion accessory. 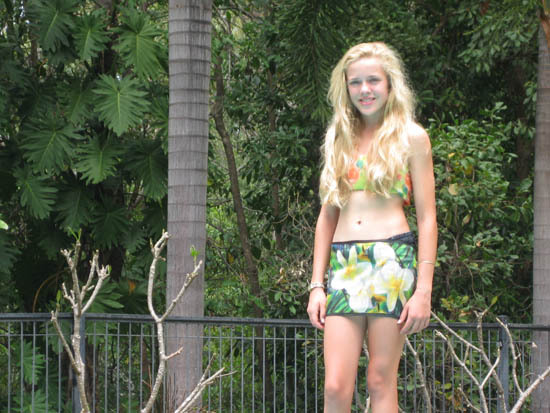 Olivia makes inventive use of frangipani 'skirt' and poinciana 'top' scarves over bikinis. Here are my three young artists a few years ago. This is not going to turn into a 'granny's brag-book' but they really deserve at least as much encouragement as adult artists, in my opinion. Lucinda begins to tie the gingers sarong scarf. Casual and relaxed here, this silk sarong is elegant for more formal wear. 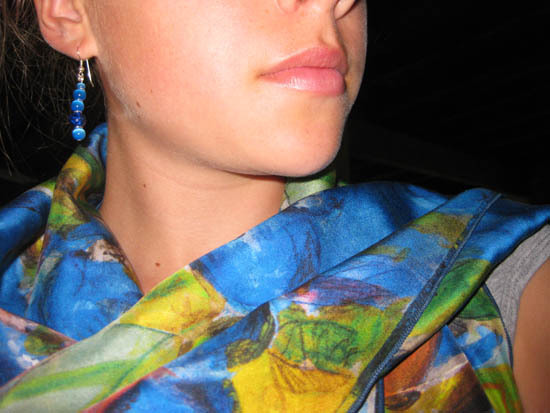 Olivia chose blue drop earrings to complement the blue berries and flowers scarf. I rather like this close-up of the scarf, showing the balance of design elements such as line, colour and texture. 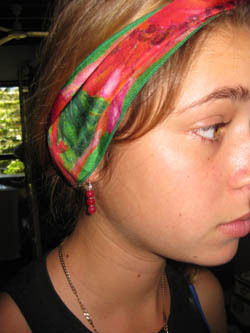 If you have already purchased silk scarves for yourself or as gifts, would you consider emailing me photos of the various ways in which the scarves have been worn? It would be lovely to put a face to the emails that we have exchanged and I would really value your interaction. 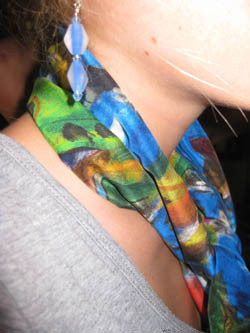 However, even close-up 'details' of how you are using your scarf would be helpful to others. Please make sure that the photos are in focus and that you send them at a reasonably high resolution/size (say 500kb+) so that I can crop them if required. If you could also write a couple of sentences about your scarf (eg is it versatile, easy care, does it feel luxurious etc?) that would be appreciated. Anything that you don't like about it? My idea is to build a new page about wearing scarves, aimed at the more mature 'fashionista' (or just normal person who wants to look fabulous on occasions!). Jasmin and Olivia have given us their ideas, which look casual and comfortable. Now let's spice it up a bit? Or not...? Your voice and I'm listening. Anyone who is kind enough to contribute in this way will be sent a small scarf as a thank you gift and will be offered 10% discount on their next scarf purchase. If you are looking for more ideas (50 more!) do check out this hard cover small book, published in 2014 that illustrates ideas that suit casual or more formal looks so well. How to wear scarves - some ideas. 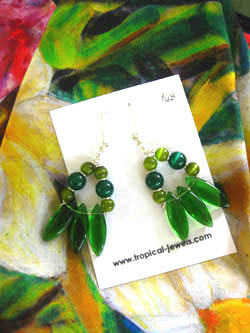 Earrings pick up the green in this red gingers scarf. Pale blue earrings complement this scarf. 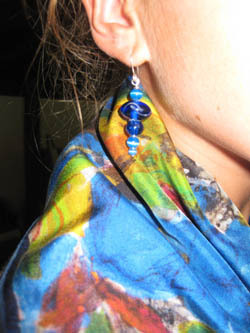 Dark blue earrings work well, too. 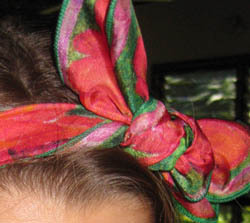 How do you wear your silk scarves?